Karen Fisher owns and operates the local shop Art Mart where she supplies students and professionals alike with their art-related needs. Karen will be joining us at Interrobang Wayzgoose as a vendor this year. An Interrobang veteran, Karen has attended every year and has been a staple in the festival since its beginnings. She has a wealth of experiences with Interrobang that have not dealt strictly with printing, bookbinding, and art. Just last year, Karen was watching one of the many presentations Interrobang hosts when she noticed a bat was flying around! Everyone had a great laugh over the incident. Random events like these make every Interrobang unique and memorable, adding to the joy, amusement, and laughter that can be found at the festival. All animals aside, Karen also testifies to the diversity and insight offered through the many presentations that occur throughout the event. Karen attended one speaker that discussed illuminating stories about the printing industry from a woman’s perspective, finding numerous parallels between the stories and herself. As her example demonstrates, everyone who attends Interrobang will both learn about fascinating arts and artists and find something that speaks to them and their experiences—regardless of your profession! Karen’s shop at Interrobang will bring the art supplies offered in her downtown shop. She will be selling a small rack of decorative papers. These papers feature gorgeous designs with varied textures that can be used for book covers, cardmaking, and any other project involving paper. Additionally, Karen will be selling print blocks, which are blocks of wood carved with designs that are used to print images or patterns onto paper. This style originated in China, going as far back as the 7th century. 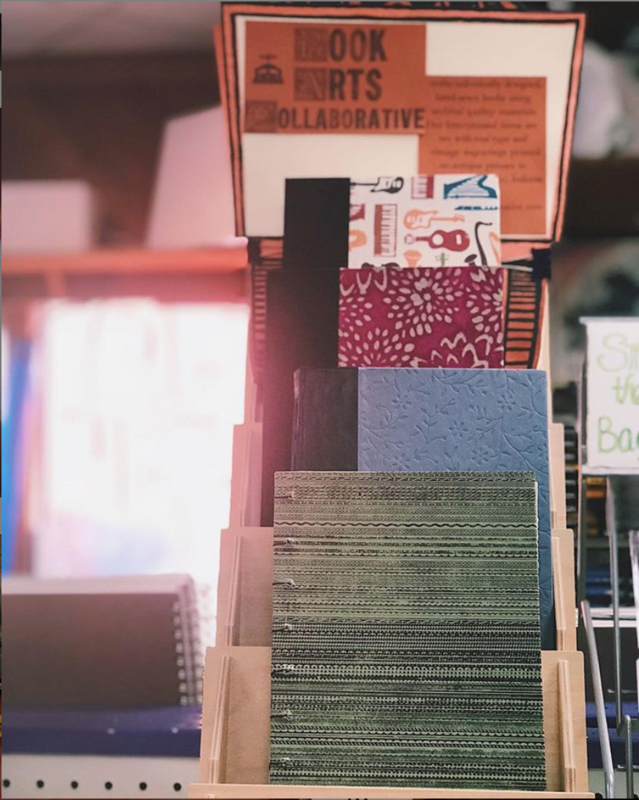 These blocks are covered with ink by a brayer (another item Karen will be selling), which is an ink-covered roller, and then pressed onto paper. Karen will also be supplying ezcut and lino, another style of printing blocks. They are blocks of synthetic rubber-like material that can have images carved into them with linoleum cutters. Just like the woodblocks, these are used to print images onto paper, but unlike woodblocks, anyone can carve their desired images into them! Karen will also be selling various inks and carving tools. Karen truly appreciates what Interrobang can do for her own business and personal growth. She may have numerous years of experience in the art world, but Interrobang allows her the chance to engage with the evolving industry. New materials are constantly introduced while old-school items fall out of fashion, so if Karen wants to be an expert in her field, she must continually test and try new tools. Interrobang provides her with this opportunity while also giving her a place to bring her expertise in the field of art materials and fulfill her passion for helping artists develop their own skills. Not only is Interrobang tons of fun, but everyone is guaranteed to leave with loads of knowledge and inspiration. Come meet Karen and see what Art Mart has to offer at this upcoming Interrobang and the many yet to come.